Abstract: The simple balance has many elemental and interesting relationships with complex biological and physical problems. A fundamental equation of equilibrium, derived from two equivalent ways to tilt a balance, models several nonlinear phenomena in biology and physics with substitution of the appropriate functions into the basic equation. This provides new insights into the future analysis of these phenomena and may be a fruitful way to analyze many other areas as well. A balance that does not tremble cannot weigh. The simple balance has been studied since ancient times by both Archimedes (c287-212 B.C.) and Galileo (1564-1642). Since at least one of Archimedes’ notebooks is missing, the ancient Greeks may have understood several things that we never received down through the ages. Although it is one of the simplest and most examined of the physical systems, it may have deeper secrets to reveal by an unique analysis of its more fundamental properties. However, our own too rapid intuition may often lead us to err. Take for example the following gedanken experiment with a hanging two-pan balance. With the balance in an initial horizontal equilibrium and resting on a table, add just enough weight to one pan of the balance so that the pan touches the surface of the table. Next add two equal weights that are ten times larger than the weight that caused the pan to touch the table. What happens to the balance when these two larger weights are added equally to both sides of the balance? This is a simple problem, but it illustrates our biases when we rely on intuition and forego scientific measurement and inquiry. When the larger weights are added equally to both pans of the balance, the pan that was touching the surface of the table will rise off of the table. The horizontal angle decreases and the balance becomes less tilted. Understanding why the horizontal angle decreases when equal weights are placed on each side of a balance that is tipped leads to some very interesting relationships. In 1834, the physiologist E. H. Weber (1795-1878) studied the senses and the responses of humans to physical stimuli. He discovered that at least a 5% difference in weight was required for people to tell the difference between unequal weights. He hid the weights with a lightweight paper so the subjects could not see them. If the weight placed in the subject's hands was 100 grams for each hand, then he had to add 5 extra grams to one hand in order for people to sense that one hand held the larger weight. However, if the weight was 80 or 60 grams, he had to add 4 or 3 grams respectively for people to tell the difference. This law, which is also named the Weber-Fechner law, gained wide recognition when it was discovered that many of our sensory perceptions follow this law. However, the underlying basis for this law hasn't been clearly understood. Could it possibly be a basic physical law? If we examine more closely the various ways that a balance can be tilted, then the physical basis for the gedanken experiment and Weber's law may become evident. At the top of Fig. 1 is an equal arm balance with equal sets of weights in horizontal equilibrium. Shown on the left side of Fig. 1 is one way to tilt this system by placing unequal weights on the right and left pans together with the original weights. This tips the balance toward the side having the most weight that creates an angle a from the horizontal equilibrium. There is an alternative but equivalent way to produce angle , which is by moving some of the original weight from one side and placing it on the opposite side as shown in the right half of Fig. 1. Fig. 1. Equivalent ways to tilt a balance to create identical angles . 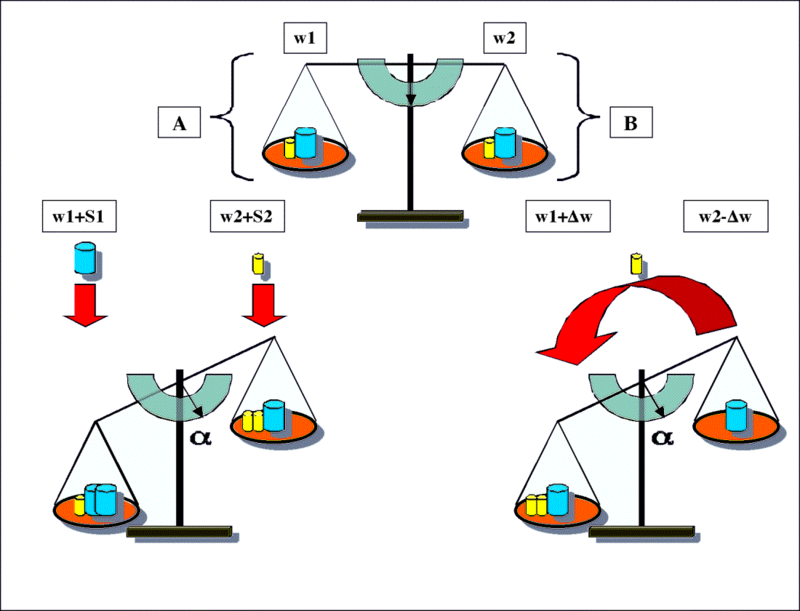 These ratios show why the pan of the balance was lifted off the table by the addition of equal weights in our previous gedanken experiment. If w1 and w2 are equally increased, then the ratios will be decreased along with the corresponding angle . where w1 and w2 are the initial weights in horizontal equilibrium. S1 and S2 are the additional weights added to each side as shown in Fig. 1. Eq. 2 is a fundamental equation of physical equilibrium that measures the net amount of stress applied to the initial equilibrium. In 1993, Eq. 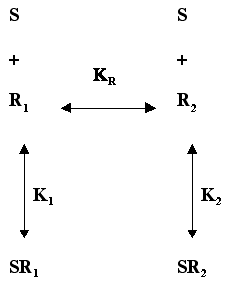 2 was shown to obey Weber's law (1). Surprisingly, the manner by which biological receptors compress the sensory functions by a ratio-preserving process is strictly compatible with Eq. 2 (1). At that time, it was also suggested that a modified version of this equation could model the responses of biological receptors (1,2). This general expression compares the relative effects of the two functions f(S) and g(S) on an equilibrium system, which allows us to consider more complex variations of Eq. 2. Two of these variations are presented below. More than half a century ago Langmuir (1881-1957) proposed the chemical binding isotherm equation, such as SR = R(S)/(S+K), as a description for the absorption of molecules onto surfaces. Since then it has been used universally in pharmacology and chemistry to describe independent, single-site, binding of one molecule to another. 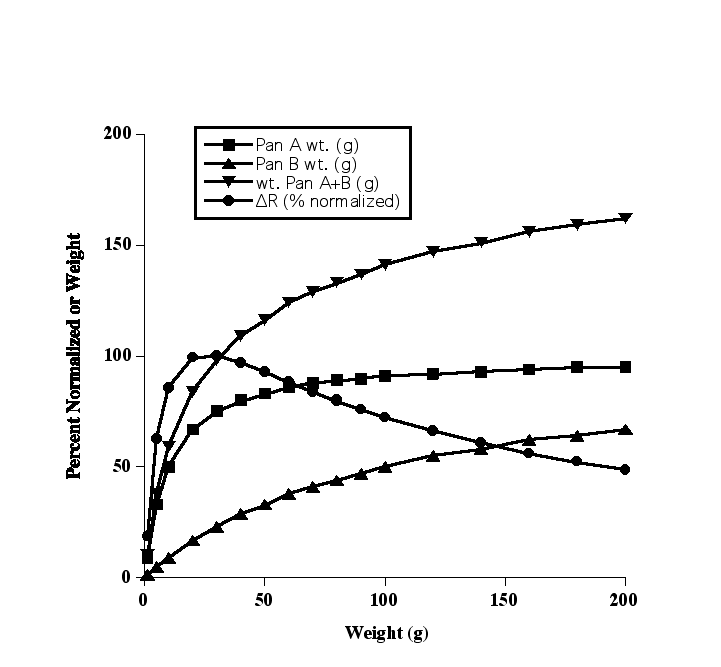 If the weights are applied to the pans of the balance according to the Langmuir equation, then we can measure the stress produced by unequal weighting to the two pans of a physical balance similar to the unequal binding of a molecule to either side of a chemical equilibrium. where R represents the change in the amount of "weight" equivalent to the perturbation produced by asymmetrical molecular binding (K1 ≠ K2) (2). This provides a convenient method to calculate the initial stress applied to a two-state equilibrium in terms of competing dissociation constants, K1 and K2. When a ligand binds with a greater affinity to one side of a two-state chemical equilibrium this stresses the initial equilibrium toward the side with the higher affinity. However, this greatly depends upon how we define the chemical species that comprise the chemical equilibrium. This binding preference also produces the phenomena known as Le Chatelier’s principle. However, there is a critical difference between Le Chatelier's principle and R. Le Chatelier's principle states that the original equilibrium will shift to relieve the stress applied to the equilibrium; whereas, R determines the amount of state that must be transferred to produce an equivalent stress on the original equilibrium. Eq. 4 was tested to see if it could generate responses compatible with those for biological receptors. For this demonstration, (S) represents an amount of weight available for Langmuir binding to R1 and R2, which is similar to the idea that the chemical concentration represents an amount of a chemical species available to combine with another chemical species. 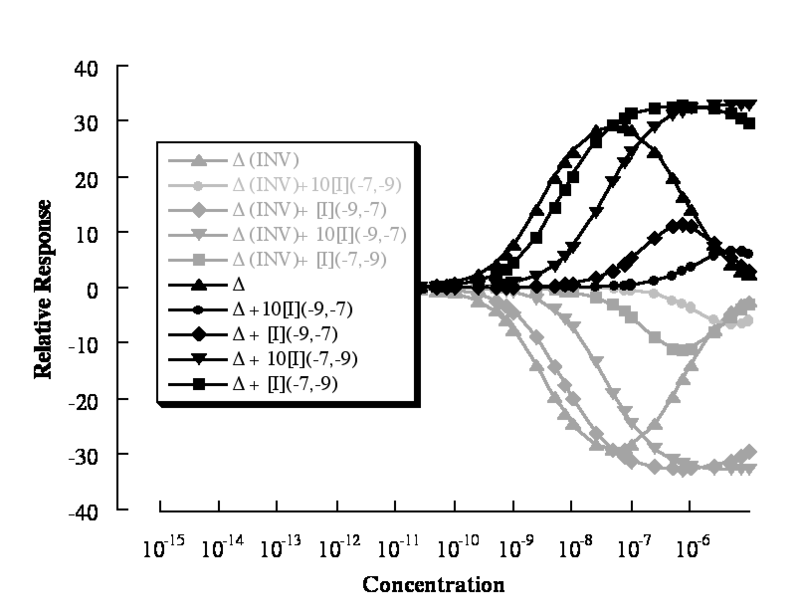 The dissociation constants, K1 and K2, are arbitrarily set to 10 and 100 (all units are in grams), which represent the unequal binding affinities (1/K1 and 1/K2) of (S) for pans A and B. The numbers aren't important, they are easy to adjust for specific examples and are provided here for demonstration purposes only. R1 and R2 were each set equal to 100, and the amount of (S) was allowed to vary up to 500. With such a simple system one does not expect to see a detailed model emerge, but on the contrary, as one explores this system further many complex characteristics of receptor interactions become evident. In Figs. 2A and 2B, the curves for Pans A and B show hyperbolic binding as expected for Langmuir binding curves. 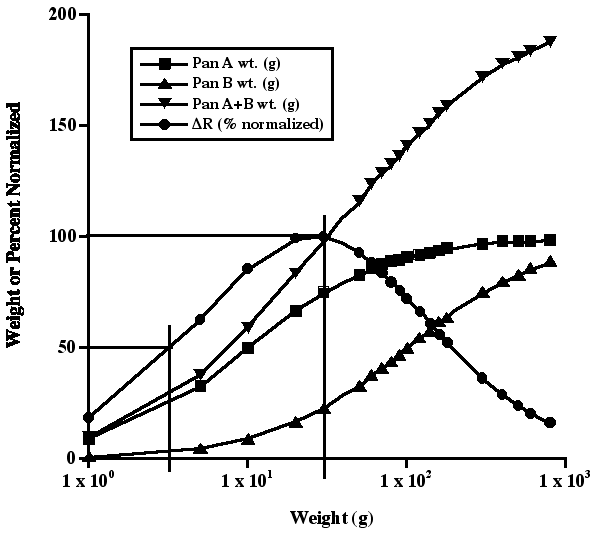 Plots of the total weight (Pan A+B) are characteristic of two-site binding curves seen in several biological and pharmacological experiments. The plot for R on the logarithmic scale shows a bell-shaped curve that rises to a maximum and declines. On the linear scale (Fig. 2B), the plot of R shows a curve that rises to a maximum and then gradually declines. These are common patterns seen in many experiments that measure the responses of biological receptors (2). Figs. 2A and 2B also display several other characteristics that are unique to response curves. First, the maximum of R is below the maximum values for any of the other curves. In Fig. 2A, the straight lines indicate the positions on the R curve where the 50% and 100% responses occur. The 50% response for R occurs at about 3 grams and the 100% response occurs at about 30 grams. Since these points occur where there is a relatively small fraction of the total binding, this suggests a physical rationale for the phenomena of spare receptors, which is a phenomenon in pharmacology that has puzzled pharmacologists for decades. Second, the curve for R declines with the addition of extra weight. This shows that a physical balance desensitizes when the weights are applied according to the Langmuir binding equations. Desensitization, which is the fade of the response in the presence of continuous stimulation, is an essential physiological mechanism that regulates our responses to hormones and appears in a large number of important biological receptors (2). That this phenomenon occurs in our example with curves that are very similar to each other is not proof that they are similar phenomena. However, as one probes more deeply, the similarities continue to accrue. There is evidence at the molecular level that the two chemical states R1 and R2 result from the pH-dependence of a common residue within receptors (3,4). We have previously constructed a two-state molecular model that shows these two chemical states as an acid and base state. Fig. 3 shows the molecualr electrostatic potentials of these states along with a potential binding molecule. In this molecular model the acid and base states act as the switch for receptor activation (Fig. 3) (4). Agonist ligands activate receptors by showing a preference for the base state. This is the more electronegative state shown in red in Fig. 3 that attracts the positively charged end of the binding molecule shown in blue. This preferential attraction of the binding molecule for the base state places an initial stress on the original receptor equilibrium that is registered at the receptor either by a shift of the equilibrium or by a change in the underlying dynamics of the receptor (4). Fig. 3. The acid and base states of the molecular model for the two-state chemical equilibrium for receptor activation (4). The molecular electrostatic potentials are plotted as positive 25 (blue) and negative -25 kJ mol-1 (red) meshes. A potential binding molecule (multicolored) is also shown approaching the acid and base states. Extending the balance analogy further, the phenomena of inhibition and inverse agonism can be tested by adding the factor of (1+[I]/Ki) for a competitive antagonist, [I], binding to each state with the dissociation constant, Ki. For competitive inhibition of Langmuir binding, this factor is multiplied times each of the dissociation constants, K1 and K2. 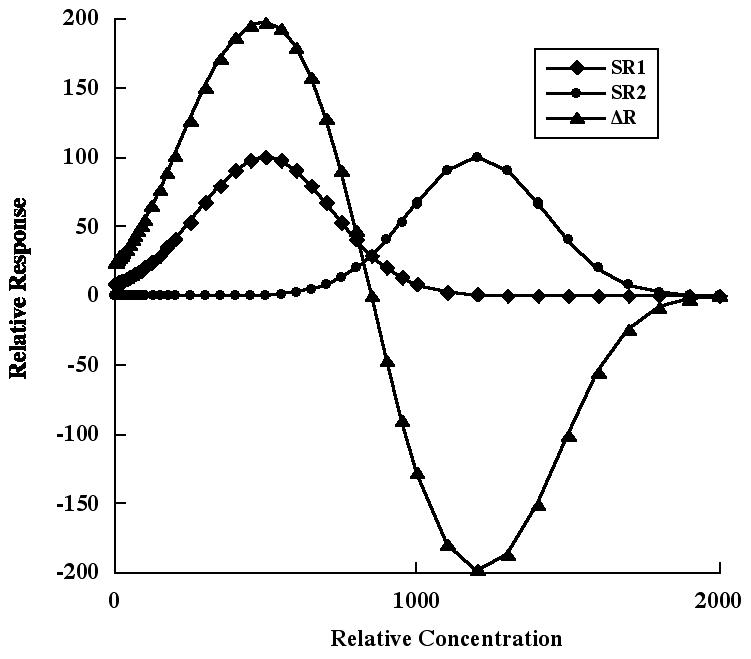 The Langmuir functions then become, SR1 = R1(S)/(S+K1(1+[I]/Ki)), and SR2 = R2(S)/(S+K2(1+[I]/Ki)). An example of this is shown in Fig. 4 for " + [I](-7,-9)" and " + 10[I](-7,-9)", where " " is shorthand for R. The two plots of with the inhibitor, [I] and 10[I], display the parallel shift to the right typically seen in competitively inhibited dose-response curves. However, there are often examples where the inhibitor does not have exactly equal affinities for each state. If we allow the inhibitor to have different dissociation constants in place of the single Ki, we can create series of plots that show a wide range of variations seen in many biological and pharmacological dose-response experiments (Fig. 4). Fig. 4. Plots of R, replaced by " ", from Eq. 4 with the addition of the expressions for the competitive inhibitor, [I]. In the legend, the numbers in the parentheses after [I] replace the single parameter Ki. These numbers represent the exponential values for the dissociation constants of the inhibitor for each receptor state, R1 and R2. The (INV) plots, shown in gray, are from Eq. 4 with K1 ≥ K2, which makes negative. If the K1 and K2 values are reversed, then Eq. 4 is negative, which produces the inverse agonist responses as shown in gray in Fig. 4. This suggests that the binding ligand prefers the other state, which has been previously observed for inverse agonists. Surprisingly, our simple balance model appears to describe the relatively complex nonlinear properties of inverse agonism and modulation observed in many biological receptors. Also, this model has previously described receptor activation, fast receptor desensitization and a general method for preventing desensitization (2). However, whether the balance represents a realistic model for biological receptors is not the main issue. The overall analogy suggests that we are measuring something fundamental to both a physical balance and the chemical equilibrium of biological receptors. Is this really so far fetched that the weighting of a balance corresponds to the perturbations of ligand binding to receptors? Perhaps it is how the underlying equilibrium in either system becomes stressed that is the core concept most important to measure. For some arbitrary values, the resultant R has a positive and negative side as shown in Fig. 5. The values of the parameters are not particularly important for this example. The important point is that we can substitute a new function in place of the Langmuir functions and achieve another interesting result. Just as the balance can move either up or down, so the graph of R shows that weighing competing Gaussian probabilities produces a sine-like wave. Fig. 5. Plots of the Gaussian functions and R from Eq. 5. The x-axis is arbitrarily labeled "Relative Concentration", but this could have just as easily been labeled "Relative Probabilities" depending on the interpretation given to the functions of S. Could this be the source of the negative probability that Feynman found in quantum theory (5)? It is interesting to consider that two competing Gaussian probabilities yield a new character R that can be negative and describes the stress placed upon the underlying equilibrium of the probabilities between two states. Obviously some of these examples are more developed than others, but the important point is that a fundamental equation of equilibrium derived from a simple balance may provide new insights into complex phenomena in biology and physics. The extension of this approach to other areas may prove fruitful as well. 1. R. G. Lanzara, Math. Biosci. 122, 89 (1994) - Link. 2. R. G. Lanzara, Int. J. Pharmacol. 1(2), 122 (2005) - Link. 3. L. A. Rubenstein, R. G. Lanzara, J. Mol. Struct. (Theochem.) 430, 57 (1998) - Link. 4. L. A. Rubenstein, R. J. Zauhar, R. G. Lanzara, J. Mol. Graphics Modell. - Link. 5. R. Feynman, In Quantum Implications: Essays in Honor of David Bohm, B. Hiley, F. D. Peat, Eds. (Routledge and Kegan Paul, London, 1987) - Link.